Access to specialty care continues to be a major challenge for low-income and underserved Californians. With provider shortages and long wait times for appointments, demand continues to outpace the safety net’s ability to meet the needs of its growing patient population. To address this challenge, many health centers, systems, payers and policy makers are turning to electronic consultation and referral, or e-consult. 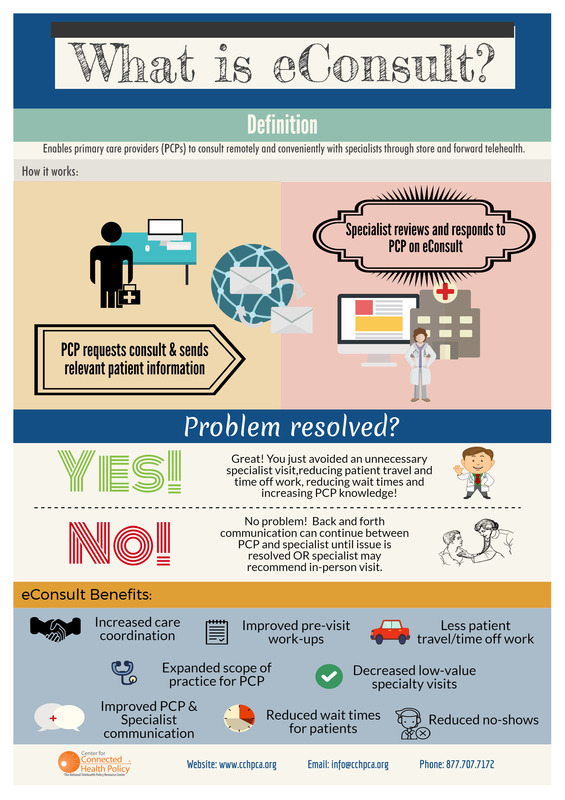 An e-consult, is an asynchronous dialogue initiated by a physician or other qualified health care professional seeking a specialist consultant’s expert opinion without a face-to-face patient encounter with the consultant. To capture the service rendered, the specialist will report a CPT code for inter-professional consultation. E-consults provided by consultative physicians include written reports to the patient’s treating/requesting physician/qualified health care professional. To improve the way that California’s safety net providers coordinate care for their patients, from 2014 to 2018 Blue Shield of California Foundation has supported the spread of e-consult in the California safety net. E-consult reduces wait times for specialty care, eliminates unnecessary appointments, and also strengthens relationships between providers, enabling them to more effectively and efficiently meet the healthcare needs of low-income families and individuals across the state.